As I write, there is a notebook on my desk filled with thoughts about Homesick. On one page, my sprawling handwriting describes puzzles and possible solutions. Arrows and exclamation marks connect individual pieces of evidence; wrong answers are stricken from the page with angry, black lines. On another page, mysterious swoops and strokes of the pen are decoded into the English alphabet—a cipher made sensible. I remark on this only because it’s unique. If I take notes on a game, they are directly tailored for the purpose of an article… or they’re notes designed to help me remember my character build in an RPG. I hardly ever write down sleuth-like deductions working towards solving one great mystery, but those are the precise type of notes that I was inspired to take. Originally backed on Kickstarter, Homesick is an exploratory, interactive storytelling experience by Lucky Pause that unfolds within a single building. While the premise may not sound riveting, the environment has a magnetism that is amplified by gorgeous graphics and mysteries that beckon from behind locked doors, unintelligible ciphers, and combination locks. In my last encounter with Homesick at PAX, I compared my experience to Gone Home, though now I would say that it’s closer to Dear Esther’s ephemeral storytelling. Whereas Gone Home tells a straightforward story of teenage adolescence through scribbled notes, Homesick shows rather than tells, allowing players a glimpse into the story while nudging them to connect the rest of the dots. The building itself is a character. Though in a state of decay, the absence of its former occupants have a tangible weight, like ghosts peering out from wistful letters or choice pieces of room décor. Your goal as the player character is to determine what happened to these occupants, and why you were left behind. Your secondary goal—which is more aptly described as a raison d’être—is to bring beauty back to the decrepit setting. Without spoiling too much, unlocking new locations and progressing through the game hinges on this very purpose. Proceeding through the building also relies on solving very clever puzzles. 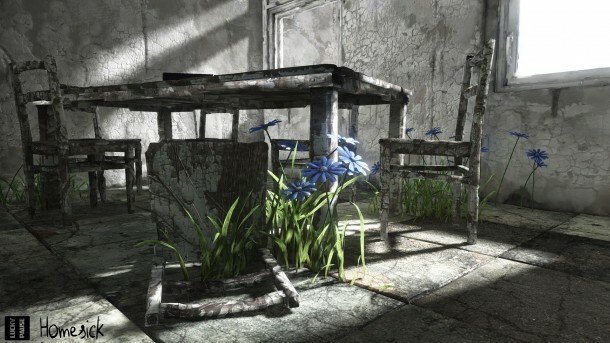 There is one major puzzle per area within Homesick, and each relies on some significant observation skills. While a few puzzles follow the more traditional path of “Find object A, combine with object B and use on location C,” others require players to delve through documents to find combinations, to pay close attention to surroundings to decrypt a cipher, or to simply have a basic grasp on physics. At times, how to interact with the puzzles was a little unclear; one particular puzzle involves actual typing, which may make the experience difficult for those who prefer to use a controller. These occasions were few and far between, however. I was largely impressed by how fair these puzzles felt in the mythos of the world. All were cunningly integrated into the story itself. Even the seemingly arbitrary obstacles that you’ll encounter are wholly justified by the story and feel like an organic extension of the game’s tone. Completing each area initiates a nightmare sequence, which plays very differently than the casual daytime exploration. Pursued by inky, dripping shadows, I found myself running blindly with axe in hand, unable to stand still lest the darkness swallow me. As I grew more acquainted with the rhythm of the game, my running became less frantic and more focused. These fast-paced segments of the game serve a purpose, too, and often require advanced planning. 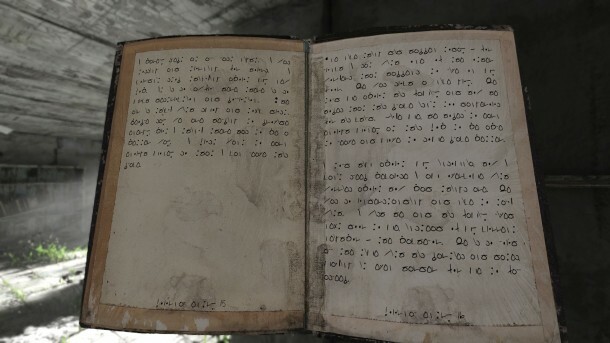 An example of the cipher found in game. Don’t worry: you don’t have to decode it by hand. The solution is far more clever. As previously mentioned, both puzzles and gameplay mechanics alike are impressively integrated into the story, which packs a hefty emotional punch. For example, much of the game’s paper flotsam is encrypted in a strange code. Solving the cipher involves a clever mechanic that tugged at my heartstrings and made me sigh a bereaved “Oh…” Going back to earlier areas of the building and re-reading previously illegible notes had a similar effect. Finally, upon making another significant discovery at the game’s conclusion, I was at first fearful of what I saw…and then incredibly saddened by it. If you commit to Homesick, be prepared for a heartfelt and, at times, heartbreaking experience. The game’s emotional impact is heightened by its simplistic soundtrack. 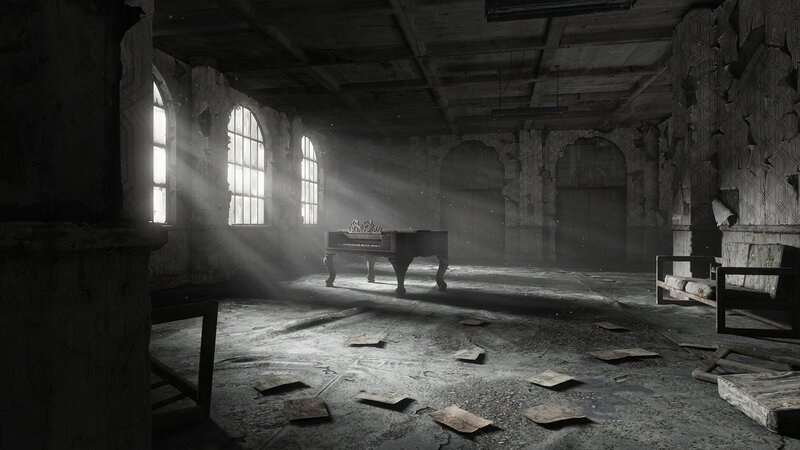 The solitary piano notes and lonesome cello suit the isolated environment perfectly, and, as I solved puzzle after puzzle, I felt as though the songs were becoming more complex. It was as though the discoveries that I made in game recovered missing notes from the score, allowing both story and song to become more filled out and heartbreakingly beautiful. While I clearly enjoyed my experience, Homesick is not for everyone. Inevitably, there will be discussions of its candidacy for game-hood, which will press onwards and yet go nowhere as they did when Gone Home and Dear Esther were the focus of such talks. I cannot stress enough that this is an exploration game, and so it may not be an ideal fit for those players who are less willing to sift through drawers and backtrack to read notes left behind by absent characters. It is also a short experience, best played out over a couple of hours on a lazy afternoon. This, too, may dishearten some players. That said, I would recommend Homesick in a heartbeat to any fan of the walkabout/exploration genre. I was happy to immerse myself in this world, divulge its secrets, and take notes on my discoveries. I marveled at the texture of peeling wallpaper and watched as dust particles dreamily floated through sunbeams. While the stories of the building’s occupants may not be as bright and beautiful, I was hopelessly enthralled by the task of discovering their stories. Homesick is a feat of interactive storytelling, resplendent in its game design and gorgeous graphics. Homesick is now available for Windows on Steam. A code for the game was provided by the developer for the purpose of this review. Robyn is a PhD Candidate in English Literature and a writer for SideQuesting. She has wrangled more raptors than Chris Pratt.